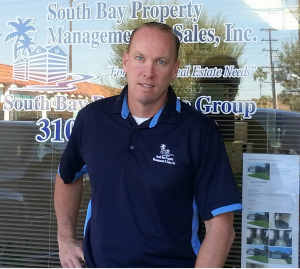 Hello my name is Tim Kelley, owner of South Bay Property Management & Sales, Inc in Redondo Beach. I grew up in the South Bay and now reside in Torrance with my wife Jennifer and our two children, so I know this area as only a lifelong resident can. With over 20 years property management experience, you will have piece of mind knowing that your investment is in good hands. S.B.P.M. in Redondo Beach offers complete property management services for single family homes, townhouses, duplexes, apartment complexes, condominium units and commercial properties. From complete care of your property to simply collecting rent, let us take the hassle out of owning and managing your investment property. Below is a list of some of the unique services we provide. If there’s a service you’re interested in, but is not listed below, please give us a call at (310) 561-8883. Web-based property management software which gives owners 24/7 access to property data and reports. Evictions handled for a low flat fee using our excellent legal service. Plus, we attend any required court appearances so you don’t have to. Scheduling repairs & maintenance using our network of qualified vendors to ensure all work is completed promptly and for a reasonable, competitive cost. Processing the payment of property bills such as gardening service, utilities, HOA dues, mortgage, and property tax. Comprehensive tenant screening by researching credit history, references, and employment. Additionally, each prospective tenant is personally interviewed in person. Most Competitive Fees for Property Management in Redondo Beach. Call us today at (310) 561-8883 for a Free “No-Obligation” Property Management Consultation or click here to send us an email.